A new social engineering scheme called, "Momo WhatsApp" is sweeping across the world. A recent social engineering scheme has spread across Latin America and could hit the borders of the United States. 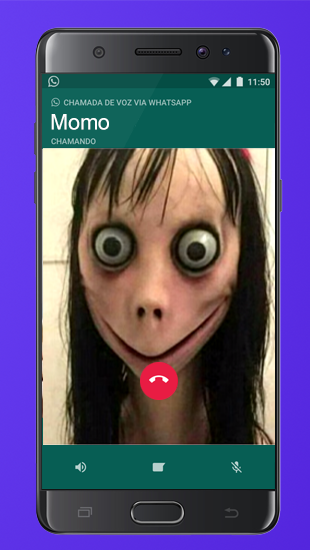 A WhatsApp contact called, “Momo WhatsApp” was posted on social media sites and has a Japanese area code and a photo displaying a bulging-eyed girl. Claims that interacting with the profile can incite youth suicide through coercion has been circulating around the Internet for days. What Do We Know About Momo? What’s known for certain is that the WhatsApp profile first appeared on Facebook and since then people from all over the world have been trying to make contact with it. The image used by “Momo” is from a sculpture exhibited in a museum in Japan in 2016. While Momo has elements of conspiracy theory, the scheme is actually a prime example of a social engineering attack designed to foment fear. The fallout has seen copycats springing up all over the web, possibly inciting cyber harassment or self-harm to young people. Our security experts at dfndr lab added the alleged Momo number to WhatsApp and received no response with attempts at contact. We’ve determined that several profiles have emerged throughout the world using this same photo, so it’s not possible to say with certainty that the creator of the original contact has made the threats, or that they even exist. “From the moment this contact became viral on social media sites, several bad actors are taking advantage of the fear and creating new profiles to frighten people, further increasing alarm and encouraging actions that could lead to harm,” warns the director of dfndr lab, Emílio Simoni. How Do You Protect Children From Malicious Profiles? The most vulnerable victims to these types of social engineering attacks are young people. Even though the Blue Whale Challenge and Momo WhatsApp could be construed as urban myths, instances of cyberbullying and online harassment are very real. 1. Keep contact lists transparent. Enable parental controls by locking down your child’s contacts list. Ensure they are not exchanging information with people they don’t know. 2. Pay attention to social networks. Be aware of what your children are sharing on social media accounts, especially their phone number. Remember that a number can be accessed and used by malicious people. 3. Always use a good antivirus. Make sure everyone in the family has antivirus protection on their phones, such as dfndr security, A warning will pop up whenever your teenager receives a malicious link in WhatsApp, SMS, and Facebook Messenger.